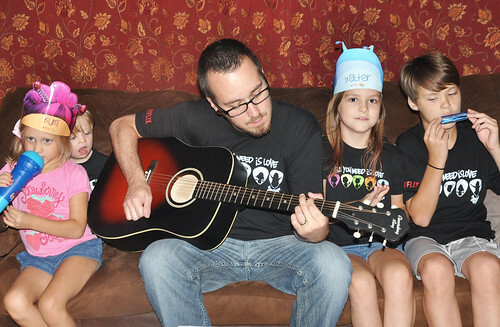 My family loves music! That shouldn't be much of a surprise considering my husband and I met when we were cast as Adam and Eve (the leads) in a musical. 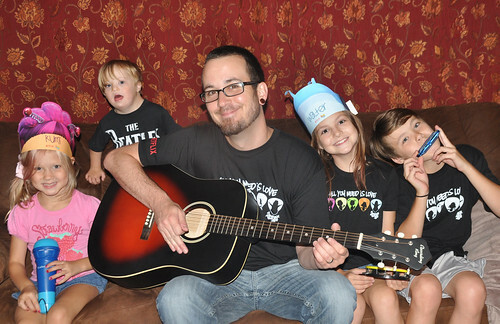 Our kids were destined to inherit our love of music! Dylan was in band and chorus for the past two years. I'm so proud of him for learning how to play the trumpet but it wasn't for him. He's giving up band this year for sports and playing guitar on his own time. Chorus, however, is still mandatory! Lexie loves to sing. She plans to join choir this year and play the flute that once belonged to me in band next year but her real love is being a backup singer for her dad! Lily...well, Lily is destined to be a female rapper. Perhaps I will share that video later this week! And Liam LOVES music. As soon as he hears a beat his hips start moving! As for the super cool parental unit things have changed. Grant and I aren't able to perform in musicals anymore. We tried to get back into musical theater when Dylan was a toddler but the rehearsal schedule was just too much with work and a young child. I'm not going to lie: I miss the stage terribly. These days my performances are limited to belting out show tunes in my mom taxi! A few months ago Grant picked up his old guitar just to let off steam after returning home from a stressful office job. It renewed his passion for music and he started to do cover songs. He was so into his rediscovered hobby that we bought him a new guitar for his birthday. He currently has a YouTube gig going on with a friend and Lexie loves to do backup vocals for them! Needless to say my younger kids love shows with lots of music! We mostly stream Netflix in our home because I'm a big fan of the wide variety of choices for my kids. There truly is something for every person in our family. And just when I think Netflix couldn't possibly come up with a show better than the last one we loved they work their magic again! 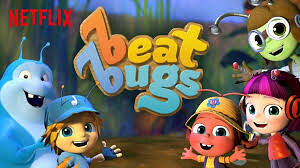 My Beatles-loving daughter, Lexie, was thrilled when I told her that Netflix was releasing a show inspired by Beatles music called Beat Bugs! It was made for the younger crowd but she couldn't wait to hear the music. Beat Bugs did not disappoint! It is such a fun show featuring the adorable characters Kumi, Walter, Jay, Crick and Buzz. No matter how you feel about the Beatles there is no doubt that their music is very recognizable and VERY catchy! If you watch (and you totally should) you just might recognize the voices of a few famous singers, including Pink, Eddie Vedder and Sia! My younger kids loved watching Beat Bugs! Liam only pays attention to the TV if there is music so this show is perfect for him. He actually stopped playing to stand up and dance while we were watching. Lexie sang along to all the songs and I found myself singing along with her! This show is entertaining for kids AND their parents! 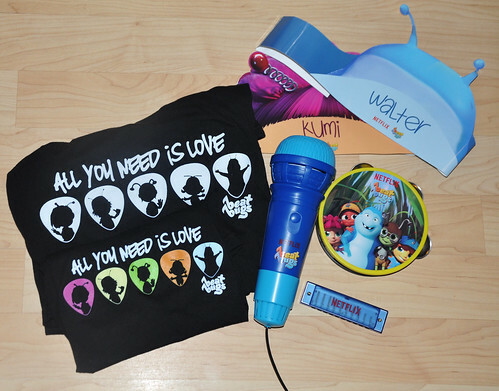 When our #BeatBugs package arrived from Netflix we immediately knew we were going to have a good time! Netflix asked us to share our best cover of the Beat Bugs theme song "All You Need Is Love!" My husband already knew how to play the song on his guitar so we decided we were going to record our rendition while we were at the beach last week. Of course I had to get sick with a nasty cold just before we left so we decided to wait until I got better. Unfortunately that never happened so this hoarse, congested, coughing mama sat this performance out! They didn't need me anyway. When it came time to choose which video I was going to share I was torn! Should I go with the perfect version with good lighting or the practice run which was more real? In the end I decided that the practice version was the winner. A performance with a backup dancer is clearly the best! It isn't the perfect version but I laugh every time I watch it! Netflix 6 Month Subscription GIVEAWAY!!! It's no secret that Netflix is the bomb! Netflix has graciously offered ONE 6 month subscription card to give away to one lucky reader who shares their family's "All You Need Is Love" cover on the social media platform of their choice using #BeatBugs. Don't be intimidated by this! Even a quick video taken on your phone of your kids singing along to the theme song would work. That 6 month subscription is worth it! This is a quick giveaway that ends on August 31st. Submit your share link on the rafflecopter widget below and it will open up more entries to better your chance of winning! Here are a few more fun things to watch on Netflix! We don't only watch shows for kids around here! Our kids DO share the TV and allow their super awesome parents to watch Netflix sometimes. DISCLOSURE: I am a member of the StreamTeam. As a member of the Netflix #StreamTeam I am provided with a subscription to Netflix and I also receive other products, special opportunities and exclusive information. All opinions are my own. Ah a mom taxi, I know I'll be there one day LOL! That video is SO cute! Hehe oh my goodness that video just made my morning. Now I will continue smiling as I pour a big ol' cup of coffee. Sounds like a cute show. I think I heard it playing when Simon was watching Netflix maybe! This is so stinking cute!! We need to pull this up for the kids! We love our Netflix! My favorite song is Come Together. How adorable are you guys! I love your song!